Angry Birds Get Eggs Angry Birds Get Eggs Angry Birds jumping rope, please help Angry Birds to jump as high as possible, and collect more eggs to increase the number. Freeway Fury 2 Freeway Fury 2 Freeway Fury is back! Jump from vehicle to vehicle and speed down each stretch of highway before time runs out. Horse Jumping 3D Horse Jumping 3D Prance and leap your way to elegant equestrian excellence now in 3D! Jumping Box Jumping Box A very fun and happy-feeling game, throw, slide, whip the box emoticon to his exit in this addictive physics game! Jumping Box Remake Jumping Box Remake Click on orange box and drag it in order to make it fly to the exit. Can you beat all levels? Masters Season Masters Season Drive back and forth through the levels avoiding obstacles and jumping at the right time. Rooftop Skater Rooftop Skater Skate towards the finish line while jumping buildings and pulling tricks. Runner Runner Keep running, jumping and rolling as you try to stay on the platform. How long can you go? Shotgun Orc Shotgun Orc Sidescrolling action with jumping and shooting enemy. 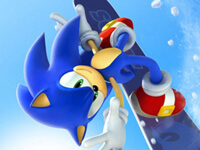 Sonic Snowboard Sonic Snowboard Perform crazy tricks by jumping ramps at just the right time and letting sonic show off his skills. Stan Skates Stan Skates Ride your board to collect bonus points and jumping obstacles! Stolen Sword Stolen Sword Try to get trough all levels by jumping and avoiding the scary pins. Street Skater Project Long Beach Street Skater Project Long Beach Skate the streets as long as you can, avoiding gnarly obstacles, jumping ramps, and coasting through checkpoints. Stunt Maker Stunt Maker Build the best bike and best stunt by jumping all the obstacles without harm to your health or run out of fuel.